The sellers and buyers rarely actually meet to swap. And really, most of them should not be called “sellers” or “buyers” anyway, because money seldom changes hands (though sometimes it does). Rather, it is a process of unloading and picking up along the road at random times. This often involves a hand-lettered sign, usually in capital letters, with a single word: FREE. The roadside swap meet is lively in the summer, especially around lake cottages but also along back roads. The display might be a single chair, a sofa, a dresser. Sometimes there is an entire collection of things arranged around the FREE sign. Occasionally the roadside offering appears to be, for a while, a revolving inventory as a house is cleared and newly discovered discards are added to the collection. Other exchanges of goods happen along the roads, too, of course—the occasional items displayed with a price, such as a set of four upholstered rattan chairs and glass-topped table one recent summer (that sign said “$500”), and the frequent garage/yard sale signs, complete with schedules and addresses. There may be some bargaining and actual cash exchanged at these swaps. The “Little Free Libraries” now appearing along sidewalks and front yards definitely count as a free roadside swap meet, also. There are many reasons why reusable items are left on the road for others to take. Sometimes an item is simply too big—why bother finding a truck to haul it to a donation center or re-sale shop? This seemed to be the case with a perfectly functional clean green-and-white upholstered easy chair with matching ottoman, arranged ready for settling into with a book, that I saw on the side of the road near our cabin. It was definitely the case with a large dresser that we ourselves offloaded. It was too cumbersome to display in its entirety: instead, we left the dresser on the road with a note saying that the drawers were at our cottage. In no time at all, a neighbor had phoned, claimed it, and returned with her truck to pick it up and haul it away. Other times a piece is still functional but much too worn or too cheap to bother trying to sell. 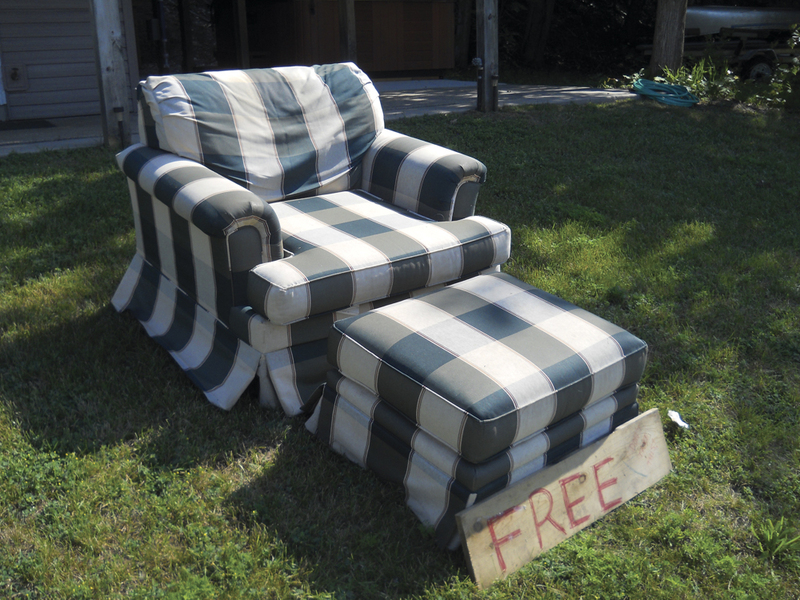 An example was a beach lounger that had been left by the road for several days but without a FREE sign. Finally, I went to the likely house and left a note with my phone number, asking if it was indeed free for the taking. A man soon called and said, “It’s yours if you want it,” but by the time that I went back to fetch the lounger, it was gone! Then, a few days later, it had returned! This time, I finally tried it out for myself and saw why it had been surrendered twice—uncomfortable! I agreed. I left it. But then it finally vanished for good. Some things are left because they do not quite work but might be worth repairing, too good to throw in the trash. This had to be the case with an upright vacuum cleaner that we found one day beside the road—we took it home, started it up, discovered that it ran but had no suction, and in the dead of night, we returned it to where we had found it. But we never saw it again; it too vanished for good. Or sometimes it is simply time to unload something that has outlasted its sentimental value. Recently, I saw a bright orange wicker chair beside the road. The owner explained, “Mom painted everything! Orange is OK, but it’s not comfortable, we never use it.” Alongside a FREE sign, the orange chair was placed beside the road with a small TV on the seat. Both disappeared. However, the chair later reappeared in front of a garage down the way, incorporated into a display of summer art projects—a whole new purpose! Along the summertime roads, I have seen a myriad of FREE items out on the great roadside swap meet: the aforementioned chairs, vacuum, TV, and ottoman; a shabbier armchair on a back road; a lone toilet; four large TVs with remotes taped to them; a full set of tires for a 2012 Chrysler minivan; a rope hammock; a Butterfly “project” sailboat; a computer keyboard and printer; an elegant-looking brown brocade sofa with Queen Anne legs on the main street in Honor; an office chair; heavy wooden planter boxes; a Kenmore gas grill; a brass planter; two large sections of orange carpeting, neatly rolled; an electric carpet sweeper; Tupperware containers; and a plaid sofa. These things all have histories. Each now-FREE item once was new, acquired for some specific purpose—maybe it was acquired with excitement at solving a problem, with delight at its appearance or quality, with thanks in receipt as a gift, inherited as a family treasure. Often there is an original price tag on the bottom, and sometimes these indicate a reduced sale price, suggesting that this item had started life as a bargain, too good to pass up. Each was valued by its first owner, and perhaps by later ones, too. But each eventually reached its limit. The backstory is not necessarily important to the item and whether or not it is useful, but the possibilities still intrigue me. Museums are filled with items whose original use has long been finished. When a museum knows an object’s provenance, the curators might tell the item’s story in a label that is rarely longer than 90 words. Most often, we cannot know—except for that orange chair whose owner was available—whether a thing had special meaning for a family, whether it is being surrendered with huge relief or with some regret. For instance, maybe the sofa on the street in Honor had been bought at a fine furniture store for a first home in the 1940s, then re-upholstered five times and used as the Coho Festival Queen’s throne for years, before being left on the curb by a grandson with a too-small apartment and no truck. Ultimately, we just do not know. But we take our chances anyway. We take a free item, give it another life, another story. And if it does not work out, we can always return it to the road for the next person to try. We hope, though, that no one takes our reusable painted wood FREE sign, because there will always be more stuff to put out beside the road. Photo caption: A special chair has its 15 minutes of fame on the front page of The Betsie Current. We hope it found a great new home. Photo by Beau Vallance.